Ring roundup: pink sapphire and diamonds. 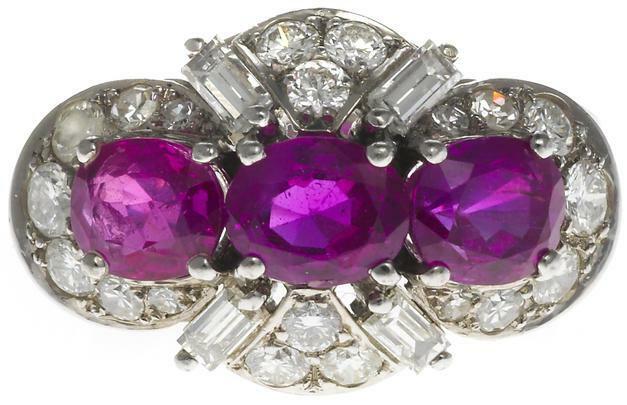 You are here: Home / Jewelry / Engagement rings / Ring roundup: pink sapphire and diamonds. Let’s talk about pink sapphires and diamonds. I thought I’d start things off with a bang by showing you this ring with its dazzling and extremely rare 17.51-carat natural intense pink Ceylon sapphire. The spectacular sapphire is cushion cut and flanked by two shield-cut diamonds, weighing 2.35 total carats. This pretty ring is by Michele della Valle. 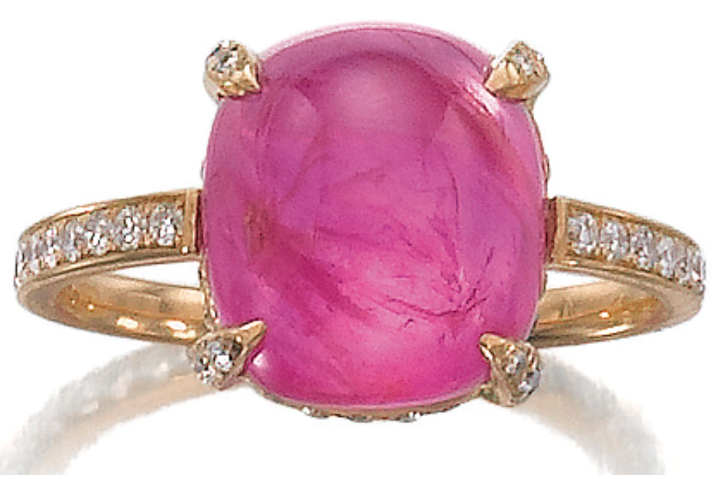 It stars a cabochon pink sapphire accentuated by diamonds set in a gold mount. This ring is by Schilling. The geometric shapes in this piece made me think it might be Art Deco, but it’s contemporary. I think it’s really fabulous. Interesting shape, gorgeous colors, lovely stones. Approximately 3 carats of oval-shaped pink sapphire and 1 carat of diamonds. The only traditional engagement ring in the bunch, this is a 2.05 carat emerald-cut diamond engagement ring. 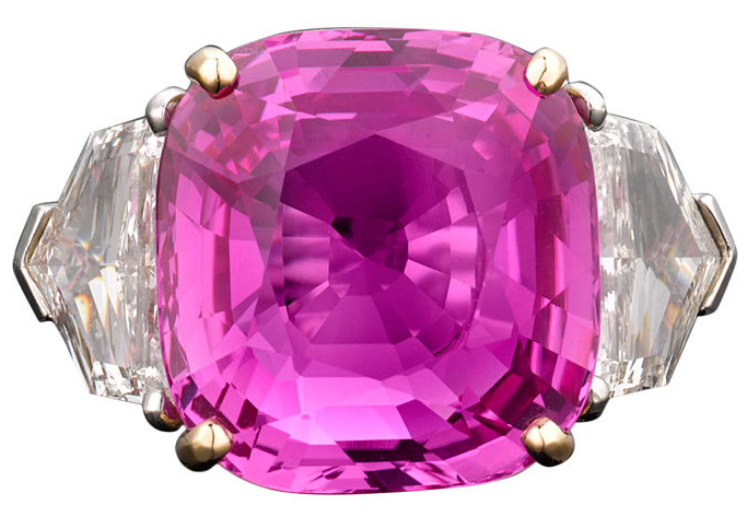 The center diamond is flanked by two trillion-cut pink sapphire side stones weighing 1.16 total carats. This ring has a simple, straightforward design – four emerald-cut pink sapphires (approx 2 cts) surrounded by diamonds. Simple, but the colors make it eye-catching. It’s also geometric, but in a more linear way. Pink sapphires symbolize faithfulness and devotion while diamonds symbolize love and beauty. They are perfect for an engagement ring! I didn’t realize that about pink sapphires – that is a great engagement combo. Thanks!